Qualification: Bridie possesses a Masters in Counselling (Murdoch University) and Masters in Expressive Therapy (Music Therapy). Therefore a wide range of methods can be incorporated into a counselling session. Some of the approaches to counselling commonly used are: mindfulness, psychodynamic, gestalt and narrative therapy and creative therapy. Experience: For a decade Bridie has met the psychological needs of individuals with mental health issues such as anxiety, depression, stress, bereavement, poor self -esteem and self -confidence, relationship conflict and trauma. Over the years Bridie has worked at several counselling organisations such Centrecare and Minnawarra House. At each of these organisations Bridie has specialised in counselling victims of Domestic Violence. Philosophy: Bridie`s philosophy is that counselling should be a process where both therapist and client are fully engaged in the counselling process. Bridie ensures that she listens to her client`s needs, fosters the therapeutic relationship and empowers her client`s to articulate their counselling goals and the interventions he or she is interested in using to reach these goals. Children spend their life playing, creating and imagining, therefore they need a therapist who can help them express themselves creatively, in order to heal. Experience: For a decade Bridie has met the psychological needs of children and youth. Some of the children`s counselling services Bridie has worked for include Minnawarra House and Centrecare. Each of these services specialised in providing counselling to victims of Domestic Violence. Bridie has a wealth of experience counselling children, she has skills in art, play, music and sand tray therapy, over the years she has found these skills to be vital when counselling a child. 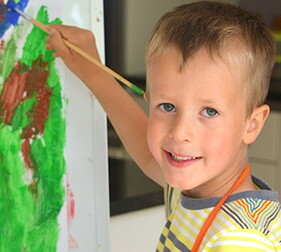 Working creatively in therapy enables a child to easily build a rapport with their therapist. Challenging clients enjoy therapy with Bridie because they are inspired to work creatively. Bridie has experience in play therapy, art therapy, sand tray therapy and music therapy. Art, music and play therapy is essential because it does not pressure a child to find the words to articulate their emotional experience.